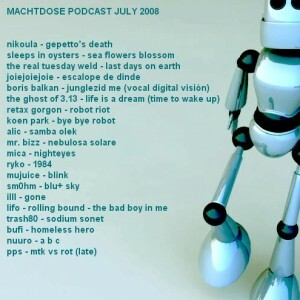 I have taken the opportunity and put some tracks in this episode which aren’t from recent releases and a bit older than usual. All in all we have mostly uplifting tunes which should bring you in a mood for dance. May the entertainment be with you. Thank you for your nice support !!! Very appreciated ! i was thinking this morning– „its about time for a new machtdose podcast“ :) this will definitey keep me entertained this afternoon…. thanks! thank you so much for your support! great set – lovely finds!